Feeling a little challenged this evening, hormones I suspect and other factors. I fell asleep earlier on the couch and awoke to Mark calling my name from his office downstairs only I did not answer him. I was in that in between state of what feels to me like death and consciousness and I could not speak. He called again for me and Eddy answered as he was sitting in the room with me. I could not tell in that instant if I was dead or alive. This is a new sensation I have been experiencing upon waking and I am trying to understand why its happening. In the past I have suffered from what can only be described as night terrors. I wake from a deep sleep in a mad panic feeling like I am being attacked. I yell and kick and occasionally have propelled myself out of my bed onto the floor. One night I had been soaking my feet before bed and had left the pan of water at my bedside, in my terror I managed to slip out of bed into the water, soaking my quilt and upsetting some framed pictures leaning against the wall eventually cutting myself. It was a real show. The anxiety that I work so hard to control during my waking hours comes out to play in force at night. This generally happens when I am alone but occasionally Mark is there to witness it and he calms me down. I haven't had the terrors in awhile and I am normally a good sleeper but this sensation of being unsure about whether I am dead or alive is alarming to say the least. I heard a story recently on NPR (the main source of all my info) about the physicist, Hugh Everett who developed the theory of parallel worlds. I wonder if this is what I am experiencing in that nanosecond between sleep and waking, another world that I am in but am not fully conscious of. Quantum quandry to say the least. Since Christmas I have been plagued by an injury to my left foot. Of course you never just hurt your foot, eventually your whole body suffers slightly from the inability to walk normally and without pain. What started with my big toe joint feeling broken has ended in a slight ache in my lower back and a major pinched nerve somewhere in my neck that is weakening my right leg. I did not consult a doctor beyond my own father, I find as I get older I feel slightly uncomfortable asking him to check my person out. So I elevated it, stayed off it a bit, took Ibuprofin, iced it. I have been limping around since the week before New Years and while I have tried to move around a bit it's been tough and I know I must walk in order to live. I've been taking a shorter walk than I normally take. I am walking less on the pavement and more on trails, through the woods. I don't try and walk everyday right now, last week I was able to ride my bike which was a nice alternative although I feel guilty leaving the dog at home, she loves to run alongside me when I ride. In general I am in less pain so I am going with that. In the meantime my dad gave me a book called "The Art of Walking" which I have been slowly reading. My dad is a daily walker and has been his whole life. We have often spoken about the role walking plays in our overall health and well-being, keeping depression at arms length. The book opens with the author falling while on his walk and breaking his arm. If I had not been reading this book about walking while I too was unable to walk I might be in much worse shape than I am today. The author notes this, that walking has kept many a person on the straight and narrow not to mention how much literature, art and music have been inspired by daily walks. I enjoy feeling virtuous rather than tense and walking ensures a little daily dose of that good stuff. My stepmother still polishes the silver, cutlery mostly they use it everyday, it was handed down to her by her mother. It was apparently buried for some years during the American civil war. I can see my stepmother in many of the houses we lived in growing up and she is standing in the kitchen in rubber gloves with the silver all laid out in front of her and she is rubbing it all with various cloths and compounds. There was also a certain amount of complaining about the silver polishing but that is a story for another day. Today as I rinsed out one of my many plastic Rubbermaid tubs and thought, this is where our culture is going. All we have left are these rubber tubs to clean and maintain, scrubbing away the bird and mouse turds. Where's all the silver? Sold away at Silver and Gold parties perhaps, sold away to pay your monthly note. These tubs stick around, ever useful to store your things whether or not there is a structure around them. I live in a converted garage. It's true. I don't inhabit a quaint ranch house as some think. It's a 900sq foot box with bad lighting. Because it's a garage it was sited as such on the property so it's tucked into the trees away from much direct sunlight. Sometime last winter I was complaining to a builder friend of mine about how dark and depressing the house was. He asked me if I had heard about Solatube. I had in fact heard of these shiny light tubes and I very quickly found a local company who came out and gave me an estimate for a few of them. The Solatube is a fancy skylight but it's smaller and easier to install, there is a lens on the end of it so the light that comes in gets spread around more. It's like a giant potlight. Last summer when GW Bush sent us our stimulus check I bought my Solatube and I have to say that it was well worth the money. Even on overcast winter days my living room is well lit instead of pitch black. My electricity bills were less this winter and overall having more natural light in the house just feels healthier. So a big shout out to Solatube for improving our lives a lot. I got married for the first time when I was 23. It was a novel concept and being an adventurous sort I went for it. I was very proud of my marriage in those early days, proud of the idea that I had become married. It was not a state I had aspired to, growing up I never actually imagined myself married. I had never given much thought to what made a marriage work or what I even wanted from a marriage but I forged ahead within this cage of normalcy. Being married gave me some credibility I thought, street cred. How bad could I be, I was after all married. Of course when you are married you become well acquainted with the person you are married to and over time people change and grow and as I got older my attitude about the whole thing evolved. I was less proud of the marriage and more hampered by it, I found it confining. The sameness, the expectation, the unchangeable roles of husband and wife. After 15 years I got out. During the period that I was single I had a lot of time to think. What I realized during that time was that I really enjoyed the companionship of men, I did not want to be alone but I was not in a big hurry to get married again either. When I met Mark I made a conscious effort to just simply be with him and have no expectations of what was supposed to happen. I watched as he showed up regularly in my world, we had a great time together and I felt strongly that I could spend a lot of time with him without any trouble. He felt the same way and after about 18 months he proposed marriage. I accepted but I felt nervous too, was I committing myself to this confinement again. We talked a lot about what we both wanted from marriage and came up with the idea that we were like 2 sovereign nations. We were both independent, self supporting, self actualized nations coming together in a spirit of cooperation. Neither nation needing the other for survival but rather identifying the benefits and comforts of certain combined efforts. I liked this, having just regained my independence and sense of self I wanted a union that would support and enhance my freedom not dismantle it over time. Mark was away in the South Pacific during this time and did not return home for 6 months after his proposal to me. It was a hard and sad winter, but I got through it and we got married about 2 months after he returned home, 2 years after we initially met. In the early months of the marriage I suffered a little. Feeling lost again in this idea of marriage, thinking I needed to assume a different role from that of girlfriend or independent island state. I talked to Mark about it and of course he was fine with the idea that I preferred the girlfriend concept over the wife concept. And so we continue as married people (for almost 5 years now) who are wholly committed to one another but with a level of separation that suits both of us. If I had to make a visual for the relationship it would be of two overlapping circles and where the circles overlap there is a lot of vibrant color and activity and where the overlap ends there is still a lot of vibrancy, just in different hues. Spring is coming and everyone is talking about planting and all that good stuff. Times are tight and I know loads of people are starting their own gardens which is a good thing. After my fore´ into the world of food growing last year—I really barely got my toes wet—it is clear to me I am not one of those food growing types. My whole gardening philosophy is to put in things that need little care, this is not a good approach when growing food. My solution is to support one of the local organic growers in my neighborhood. With cash in my hot little hands I gave my deposit check to Gretchen Woody of Holistic Homestead . Her farm is located about 8 miles from my house and last year when my farming efforts were failing I signed up for a half season with her. It was awesome. This year I thought I would get a jump on it, these farmers need cash come spring so I was happy to give it. I take pride in serving my family healthy food that is grown near by and I am also proud to help another small business person. 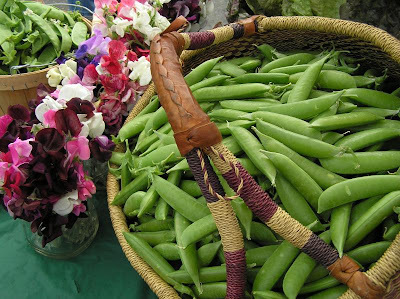 If you love vegies, consider a CSA, there are many of them in the area and farmers are grateful for early sign-ups. Seeds cost money you know and farmers need to eat so that in turn we can eat. 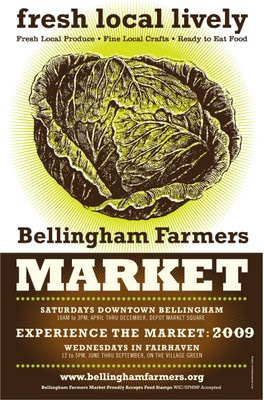 It's that time of the year again when the Bellingham Farmers Market poster gets done. We have a pretty limited budget for art so the onus is on me to come up with the visuals. This year I tried a few different things based on the new Market Directors direction and ultimately this one was chosen. I like it. This week I also got to watch the movie Helvetica. I am pretty sure non type lovers would find it all very interesting but for me it is like having someone articulate an affliction I have been suffering from. There was not one thought expressed that I have not struggled with myself. So nice to hear these elegant european men speak of the meaning of typography and how we got to where we are using the vehicle of the almighty Helvetica. And of course I felt vindicated because many of these guys admitted to being bored with contemporary type and leant more toward a few basic faces time and time again. This is how I feel. I try to look at new fonts but the forms are always saying the wrong things in the wrong way and it makes me uncomfortable. I yearn for sensible friendly, sans serif fonts that help me organize the information I am requested to by my clients. Of course being an artist means contradicting yourself wildly and using nothing but slab serifs in the work example shown here. I like those too for different reasons. For one thing they are easier to sew... I can't believe I am now starting to sew type. It's an affliction and I am trying to embrace it and see where it takes me. I have a bit more time on my hands than is normal for me. I'm worried about it but I am also enjoying it. The slower pace is better for me. I am enjoying just having time to take care of the details of my life. This week I spent 2 hours breaking down boxes for the recycling. It was 54° outside and it was really pleasant to feel a bit of spring in the air. I pulled my garbage can up to the road behind the rider-mower because Mark asked me to run the engine periodically. I went up and down my driveway on foot several times and identified a few trees I want to take down. It reminded me of the time after 911, the economy was crap then too. I was recently divorced and exhausted, I had no work and barely any interest in doing anything anyway. I spent weeks clearing out blackberries and tree branches, burning it all as I went. And now as then, in between I come into the office and think about work and move things along with various projects. Things are going to get much worse I fear but in the meantime I just have to keep going and enjoy my life, which I do, immensely. I learned during that time the importance of practicing patience, deep seemingly endless patience. It served me well and things got better over time. Today I spent an hour or so out of doors doing a little clearing in the woods outside my bedroom window. I made a big pile of sopping branches that were left over from the cedars Neil knocked down when we built the carport. I uncovered some nice big ferns which I will be able to see from my room. The earth, the humus, is so rich and brown, it's a bit of clay, a bit of loam, lots of needles and bits of prehistoric ferns, particles and particles, black and whole. I dreamed once that I was eating this stuff, I was either vitamin deficient or hallucinating. It does look so full of life and nutrients, I wanted to at least put my hands into it.